As U.S.-Israel tensions climb to unfamiliar heights, they recall a prior round of tensions nearly thirty years ago, when Menachem Begin and Ronald Reagan were in charge. In contrast to Binyamin Netanyahu's repeated apologies, Begin adopted a quite different approach. The sequence of events started with a statement from Syrian dictator Hafiz al-Asad that he would not make peace with Israel "even in a hundred years," Begin responded by making the Golan Heights part of Israel, terminating the military administration that had been governing that territory from the time Israeli forces seized it from Syria in 1967. Legislation to this effect easily passed Israel's parliament on Dec. 14, 1981. 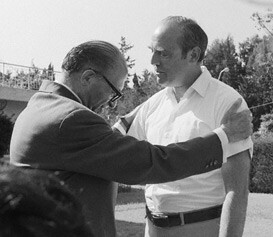 Menachem Begin with Samuel Lewis on a friendlier occasion in May 1977. This move came, however, just two weeks after the signing of a U.S.-Israel Strategic Cooperation Agreement, prompting much irritation in Washington. At the initiative of Secretary of State Alexander Haig, the U.S. government suspended that just-signed agreement. One day later, on Dec. 20, Begin summoned Samuel Lewis, the U.S. ambassador in Tel Aviv, for a dressing-down. Yehuda Avner, a former aide to Begin, provides atmospherics and commentary on this episode at "When Washington bridled and Begin fumed." As he retells it, "The prime minister invited Lewis to take a seat, stiffened, sat up, reached for the stack of papers on the table by his side, put them on his lap and [adopted] a face like stone and a voice like steel." Begin began with "a thunderous recitation of the perfidies perpetrated by Syria over the decades." He ended with what he called "a very personal and urgent message" to President Reagan (available at the Israeli Ministry of Foreign Affairs website). "Three times during the past six months, the U.S. Government has 'punished' Israel," Begin began. He enumerated those three occasions: the destruction of the Iraqi nuclear reactor, the bombing of the PLO headquarters in Beirut, and now the Golan Heights law. Throughout this exposition, according to Avner, Lewis interjected but without success: "Not punishing you, Mr. Prime Minister, merely suspending ...," "Excuse me, Mr. Prime Minister, it was not ...," "Mr. Prime Minister, I must correct you ...," and "This is not a punishment, Mr. Prime Minister, it's merely a suspension until ..."
What kind of expression is this – "punishing Israel"? Are we a vassal state of yours? Are we a banana republic? Are we youths of fourteen who, if they don't behave properly, are slapped across the fingers? Let me tell you who this government is composed of. It is composed of people whose lives were spent in resistance, in fighting and in suffering. You will not frighten us with "punishments." He who threatens us will find us deaf to his threats. We are only prepared to listen to rational arguments. You have no right to "punish" Israel – and I protest at the very use of this term. You have no moral right to preach to us about civilian casualties. We have read the history of World War II and we know what happened to civilians when you took action against an enemy. We have also read the history of the Vietnam war and your phrase "body-count." Referring to the U.S. decision to suspend the recently signed agreement, Begin announced that "The people of Israel has lived 3,700 years without a memorandum of understanding with America – and it will continue to live for another 3,700." On a more mundane level, he cited Haig having stated on Reagan's behalf that the U.S. government would purchase $200 million worth of Israeli arms and other equipment "Now you say it will not be so. This is therefore a violation of the President's word. Is it customary? Is it proper?" Recalling the recent fight in the U.S. Senate over the decision to sell AWACS planes to Saudi Arabia, Begin noted that it "was accompanied by an ugly campaign of anti-Semitism." By way of illustration, he mentioned three specifics: the slogans "Begin or Reagan?" and "We should not let the Jews determine the foreign policy of the United States," plus aspersions that senators like Henry Jackson, Edward Kennedy, Robert Packwood, and Rudy Boschwitz "are not loyal citizens." Our forefathers went to the stake rather than "rescind" their faith. We are not going to the stake. Thank God. We have enough strength to defend our independence and to defend our rights. … please be kind enough to inform the secretary of state that the Golan Heights Law will remain valid. There is no force on earth that can bring about its rescission. 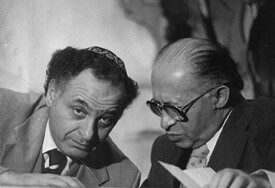 Menachem Begin consulting with Yehuda Avner. The session ended without Lewis responding. As Avner recounts, "Faced with this unyielding barrage, which to the ambassador seemed somewhat hyperbolic and, in part, even paranoid, he saw no point in carrying on, so he took his leave." Comments: (1) Late 1981 marked the nadir of U.S.-Israel relations during the Reagan administration. In particular, strategic cooperation made headway in subsequent years. (2) The ministry website calls Begin's blast "an unprecedented move"; to which I add, it was not just unprecedented but also unrepeated. (3) Begin's sense of destiny, combined with his oratorical grandeur impelled him to respond to current policy differences by invoking 3,700 years of Jewish history, the Inquisition, the Vietnam War, and American antisemitism. In the process, he changed the terms of the argument. (4) Notwithstanding intense American aggravation with Begin, his blistering attack improved Israeli pride and standing. (5) Politicians in other countries quite frequently attack the United States. Indeed, Hamid Karzai, the president of Afghanistan, did so last week. But his purpose – to convince his countrymen that he is not, in fact, a kept politician – differed fundamentally from Begin's of asserting Israel's dignity. (6) It is difficult to imagine any other Israeli politician, Binyamin Netanyahu included, who would dare to pull off Begin's verbal assault. (7) Yet that might be just what Israel needs. Mr. Pipes is director of the Middle East Forum and a distinguished visiting fellow at the Hoover Institution of Stanford University. Today, Israel suffered another heinous Palestinian terrorist attack, which took a heavy toll - three dead and seven wounded. All efforts to reach a cease-fire have been torpedoed by the Palestinians. The fire did not cease, not even for one day. The Cabinet has therefore instructed our security forces to take all necessary measures to bring full security to the citizens of Israel. We can rely only on ourselves. We are currently in the midst of a complex and difficult diplomatic campaign, I call on the Western democracies, and primarily the leader of the Free World - the United States: Do not repeat the dreadful mistake of 1938, when enlightened European democracies decided to sacrifice Czechoslovakia for a "convienient temporary solution." Do not try to appease the Arabs at our expense - this is unacceptable to us. Israel will not be Czechoslovakia. Israel will fight terrorism. Indeed, she is correct. Begin was less consistent than the words I quoted above would suggest. Related Topics: Arab-Israel conflict & diplomacy, History, Israel & Zionism, US policy | Daniel Pipes receive the latest by email: subscribe to the free mef mailing list This text may be reposted or forwarded so long as it is presented as an integral whole with complete and accurate information provided about its author, date, place of publication, and original URL.